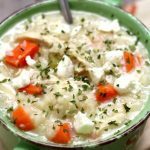 Slow Cooker Greek Chicken Lemon Rice Soup–this is a thick and hearty version of creamy Greek avgolemono soup. It has tender bites of chicken, rice, carrots and of course fresh lemon juice. 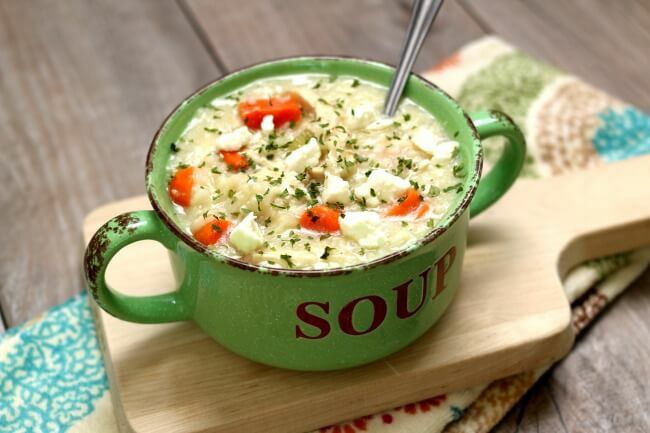 This soup has unbelievable flavor! 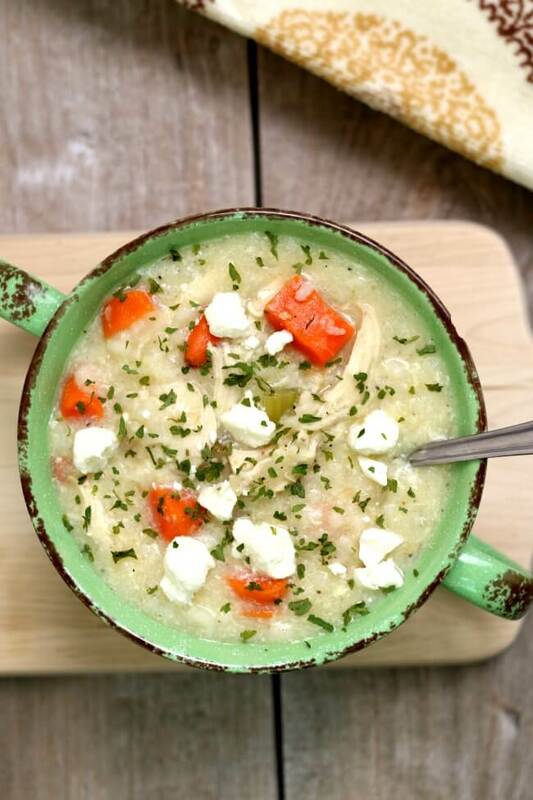 This is a thick and hearty version of creamy Greek avgolemono soup. It has tender bites of chicken, rice, carrots and of course fresh lemon juice. 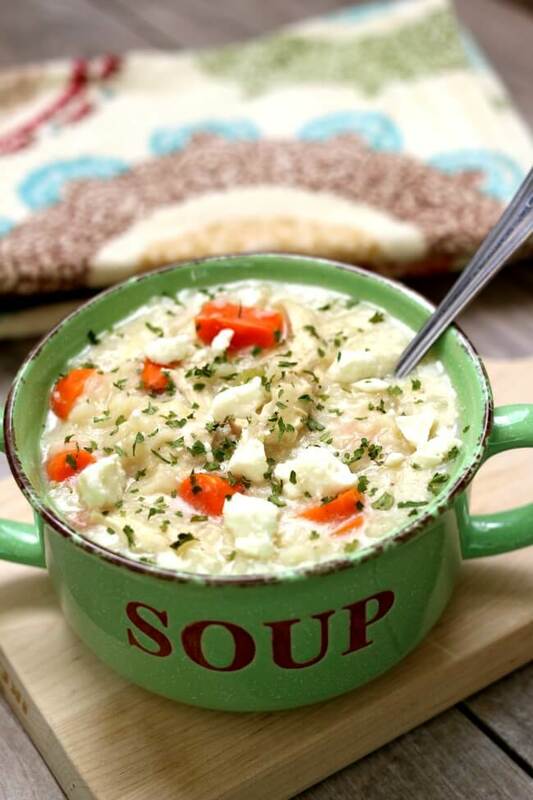 This soup has unbelievable flavor! Add onion, broth, carrots, celery, salt, pepper, rice and chicken into the slow cooker. Open the slow cooker and use tongs to remove chicken. Place the chicken on a cutting board and let rest. In a bowl whisk together the butter and flour until smooth. Ladle a cup of the soup into the flour/butter mixture and whisk until smooth. Ladle the mixture back into the slow cooker. This will help to thicken the soup. Add the lemon juice into the slow cooker. In a bowl whisk together the eggs until frothy. Ladle a tablespoon of the hot soup into the eggs and whisk, then repeat the process a few times. This way the eggs won’t scramble. Add the entire mixture into the slow cooker and stir. This will make the soup creamy and thick. Turn the slow cooker to high and let the soup thicken for 15-20 minutes. 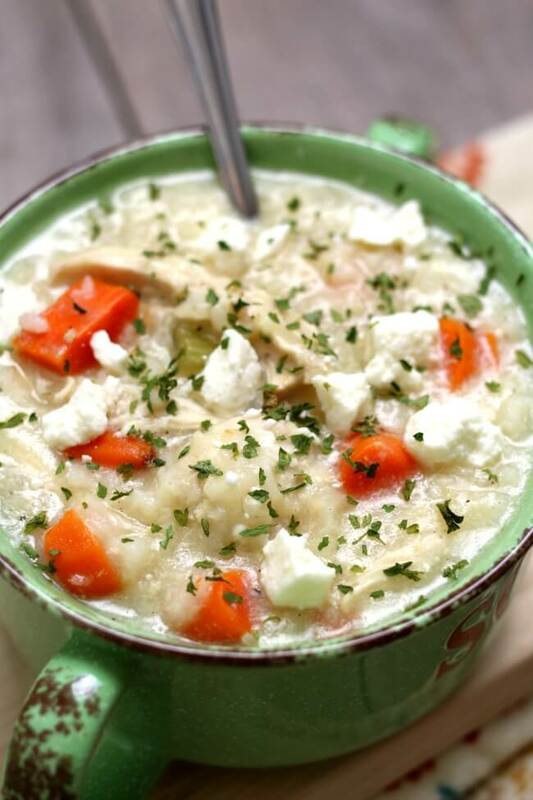 Like this recipe for Slow Cooker Greek Chicken Lemon Rice Soup? Get all my new recipes delivered to your email inbox by signing up below. Hi! Is the cooking time longer if you’re using raw chicken vs. cooked chicken? Also, are you using uncooked rice in the recipe or pre cooked? thanks! The rice is uncooked, so whether you are using cooked or uncooked chicken leave the cooking time the same. I made this on the stove-top (no Instant Pot and didn’t have enough time left for the slow-cooker) and used left-over chicken from chicken I had roasted two days ago. Cooked the rice in 2 c. of the chicken broth and the carrots, etc. in the other 4 cups, about 20 minutes each. Then added everything else in the order you laid out. Cut the final cook time (eggs) to 5 minutes, figuring the slow-cooker would be a little cooler in its heat and wouldn’t need quite that long for the stove-top version. Total time – about 30 minutes. We LOVED it! The faint lemon taste was fantastic. Thank you so much. Awesome Jackie! Thanks for your recipe notes 🙂 I love the lemon taste too. Anyway to make this a little healthier? You can leave out the flour and butter. Just use the eggs as a thickener. It won’t be as thick and creamy but it will still taste really yummy! I have been looking for a good recipe! Can the leftovers be frozen? I *think* they could but I haven’t tried it myself so I’m an unsure. I am wondering if the fact that is uses eggs would make freezing it weird??? Well…..I just made a version of this on the stove tonight just using eggs and lemon juice as a thickener, and froze about half……didn’t think there would be any issue, but will report back how it turns out. Comes out perfectly even after being frozen.